Would you like to let users add a signature to your forms? Whether you need users to sign a contract, petition, or any other form, you can easily add a field for this with our Signature addon. In this tutorial, we’ll show you how to use the Signature addon for WPForms. Requirements: You will need a Pro license level or higher to access the Signature addon. Before we get started, make sure you’ve installed and activated WPForms on your WordPress site. 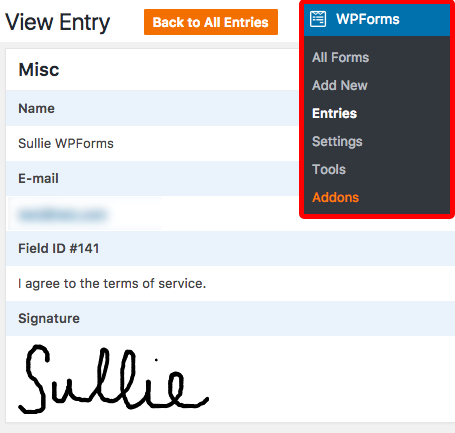 Once WPForms is installed, you can install and activate the Signature addon. For more details, please see our step by step guide on how to install addons in WPForms. 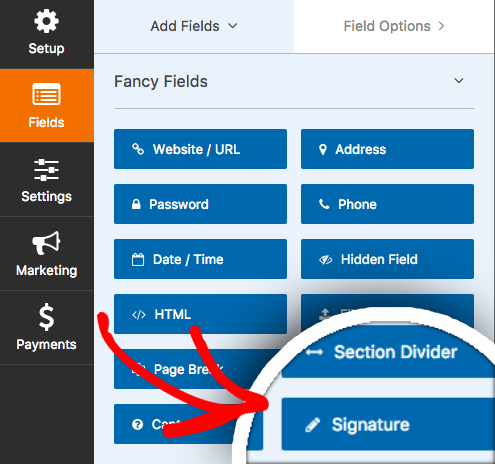 With the Signature addon activated on your site, the Signature field option will automatically be added to all forms. To access this field you can create a new form or edit an existing form. To add this field to your form, you can simply drag and drop it into the preview panel. Then when you’re ready, click the Save button for your form. If you haven’t already, the next step is to embed your form on your site. Once the form is embedded, you’ll be able to test out the Signature field. You can simply click down and drag your cursor to write. When entry data is sent in a notification email or saved to your site’s database, the signature will be saved as an image that you can easily view it at a glance. That’s it! You can now collect signatures within your forms. Next, would you like to add a terms of service to your form? Check out our tutorial to learn how you can easily add a checkbox where users mark their agreement before submitting a form. Changed: Signature field display priority in the form builder. Added: Support for Gutenberg editor with WPForms version 1.4.8. Fixed: Clear signature button display issues when using Base Styling only setting. Fixed: Required signatures fields not validating when inside pagebreaks. Added: Ink color field setting. Changed: Refactored addon and improved code.